← First Grade to the Zoo! If there’s one thing we do well at Robinson, it’s make memories! (Wait, who am I kidding–we do so many things well!) From the Halloween parade to the Holiday Sing-Along and the end-of-year staff vs. 5th grade kickball game–fun is part of our culture! Besides fun, though, we know how to make meaningful memories, too. It’s Veterans’ Day, and as we have for the last few years, we had a fabulous assembly planned—well Mrs. Kesler and her very talented cohort had a fabulous assembly planned–and our kiddos were a big part of it. They have been working since August and this year it did not disappoint! The day began in the gym, and once we were all settled, some 5th graders led in a procession of our guests of honor: veterans from every branch of the armed services. I’d love to say I had a video of this, but I just couldn’t take one–partly because of logistics, partly because of respect, but mainly because I wouldn’t have been able to see the buttons on my iPad through the tears in my eyes. Our kids gave a standing ovation while they came in, and sang a medley of all of the branches’ songs. Very powerful. 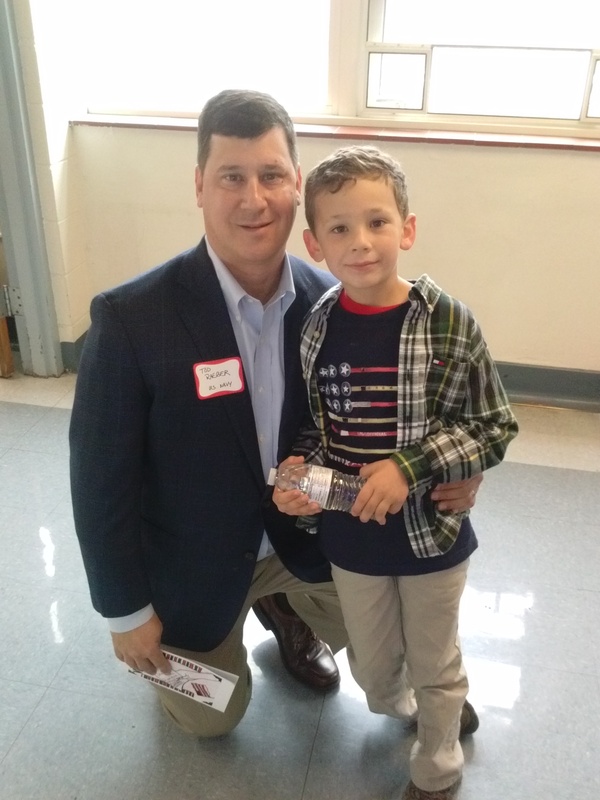 I didn’t get to catch Amelia and Mr. Wehrle because they were at the reception following the ceremony, but I did get to snap a sweet picture of Nate and his dad outside our classroom. Mr. Raeber was in the Navy for 24 years! Thank you for your service, sir! We appreciate you! A couple of other sweet things happened during our day that I just had to capture and share, too. 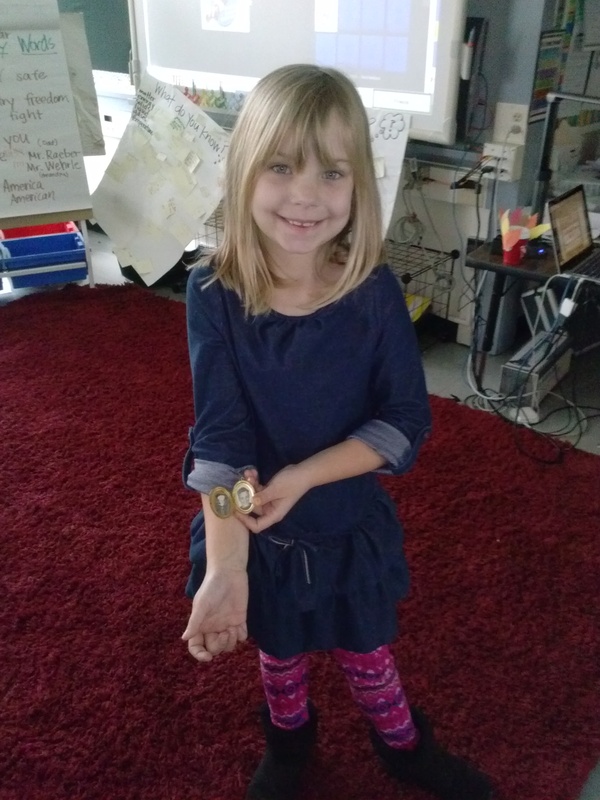 🙂 Kylie came in this morning telling me about a special locket she had that held pictures of her grandfather who was a veteran, but who had passed away recently. 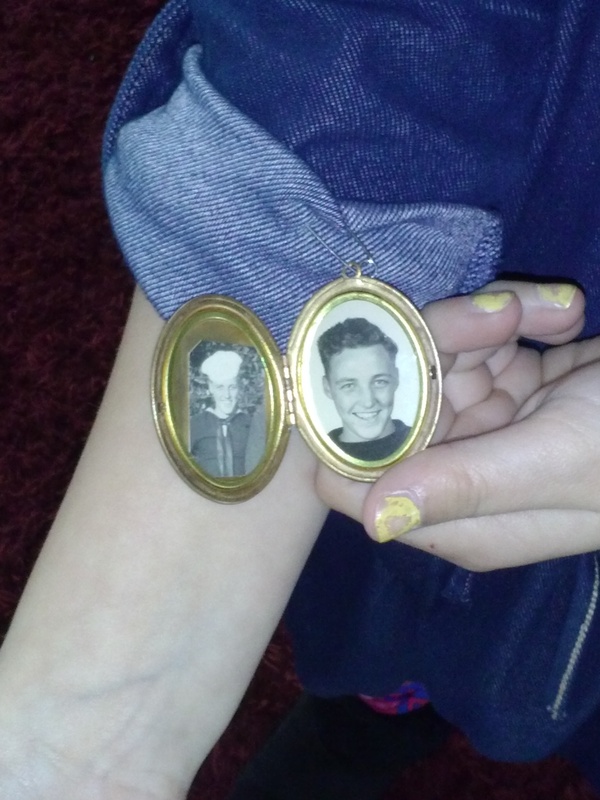 Her mom had pinned that locket to her sleeve, and so he was here with us, today, too. Wow. Later on, after our assembly during Writer’s Workshop, kiddos were brainstorming how they could include Veterans’ Day topics in their work. Millie was inspired to write a song. 🙂 Darn it–I should have gotten her to sing it. Instead, I just have the lyrics–written on a flag! How did you celebrate Veterans’ Day? 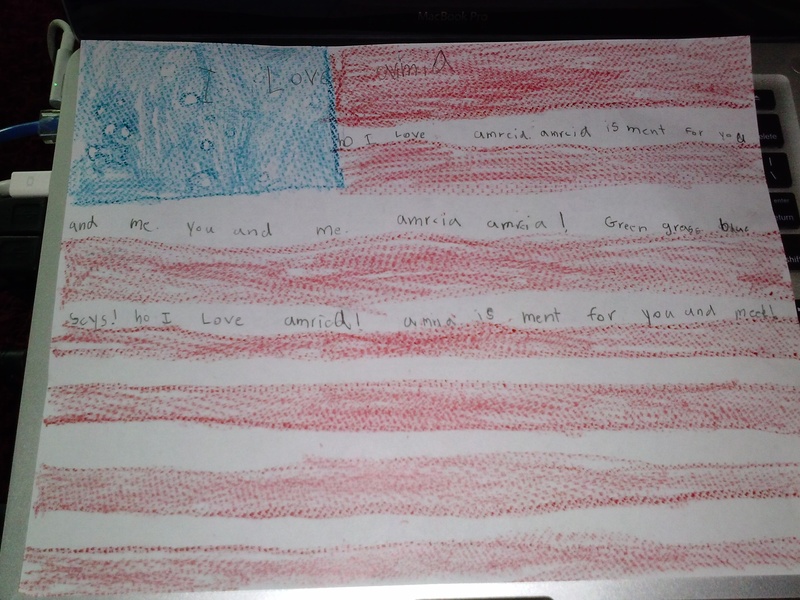 Posted on November 11, 2014 by Jen Bearden	• This entry was posted in First Grade, Social Studies and tagged appreciation, first grade, honor, patriotism, thank you, Veterans' Day. Bookmark the permalink. Thanks for posting this reflection on the day! I really enjoy the special “extras,” of the day, like Kylie’s locket, and Millie’s song! What a special day — thanks so much for sharing! Thank you for having us into celebrate and all the hard work the kiddos and staff put in to make this day special! Thank you for getting a great video, mine is too far away and I know family far away will love to see this! They were just so enthusiastic! You’re welcome! And you know, that video was really just lucky, I think. Usually I’m too far away, or even better my iPad runs out of memory before it’s over. Which happened during my 2nd grade video…..:) Glad it worked out and SO glad you and Tod could join us! Thank you so much Jen! Kylie was so excited to bring that locket to school, even though I was a little hesitant, afraid it may get lost! That was my grandmother’s locket that she held dear while my dad was in the service. When my dad passed away, I was in college and only 20, so my mom gave the locket to me at that point. I’m so glad she shared it with the class, and thank you for posting it on your blog! Very special, and I got to then share it with all of my family. Thanks so much for all that you do! !